The goals of our installation service are to install the proper products safely and securely while causing minimal damage to your property. We recommend only those products that have proved to be effective and resilient. Many of our installation methods are currently being used by baby proofers across the country because of their effectiveness. 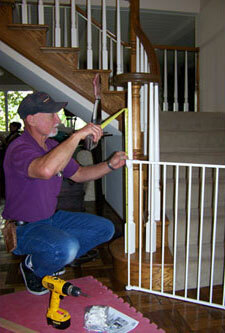 Safer-Baby goes the “extra mile” to adhere to the highest installation standards. Gates are custom-framed. This allows our installations to conform to the manufacturer’s specifications and proper height requirements. Wood framing can be painted to match gates. Baseboards, walls, and banisters are protected as much as possible. Plexiglass is cut on the premises to allow for the best possible fit. All plexiglass edges are hand-sanded to remove chips and roughness. Cabinet and drawer latches are recommended according to strength and reliability, not ease of installation. We work efficiently and clean each area as we finish. Every baby’s safety is important to us. We babyproof small apartments to the largest homes in America. We pride ourselves on giving the same high standard of installation to each and every customer. We also offer delivery service for product purchases of amounts of $250.00 or more.